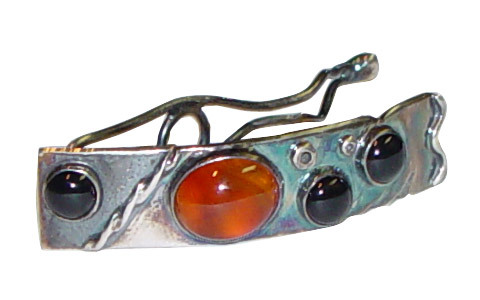 This sterling silver Hair Barrette features an orange 10 x 12mm cabochon stone set in a silver bezel. This piece is accented with three other black stones. These three stones are set in 5mm hand drawn tubes. 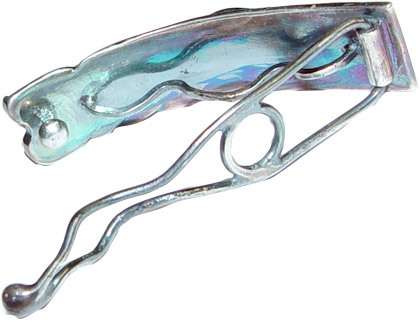 The backside of the barrette has a wavy hair grip to hold itself firmly in place and fastens tightly to a silver ball. The hair barrette has been given a patina finish and measures ~2"x1/2"